Dr Roto's website was creating as a SEO friendly website with an user-friendly back-end administration interface to easily manage clients, questions, answers, payments and pages content in a custom made state-of-the-art online application. 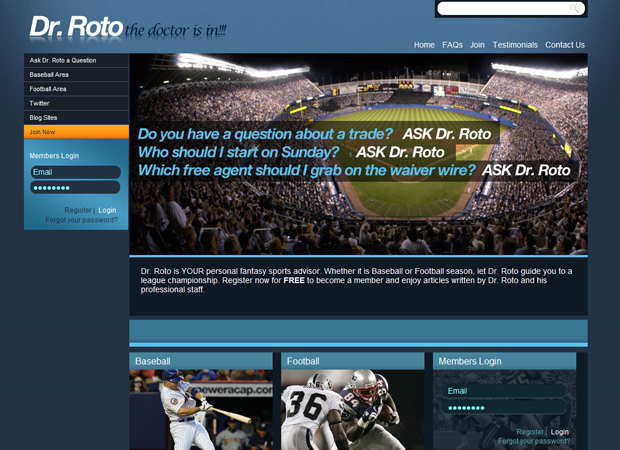 Dr.Roto is a long-time fantasy expert who has been featured on TV for his fantasy sports expertise. Additionally, he has been a competitor and commissioner in fantasy leagues for over 20 years winning numerous league championships. Dr.Roto can often be seen attending spring training games in Florida as well as NFL camps in the summer. He has many contacts in the industry and is privy to inside scoops that will put your team well on its way to winning a league championship. He came to us with the idea of an interactive website where members can ask questions about baseball and football and Dr.Roto will answer them from his own back-end administration area. All information is stored into a database and manages throughout an online client's management area custom made for this website. The final result is a very nice looking site attached to state-of-the-art online application to allow Dr. Roto and his team configures and manages every aspect of the website from a super user-friendly back-end administration interface. Additionally the website has been integrated to Authorize.net to process online credit cards and users recurring billing.